Haggerty Auto Group, with its dealerships in Glen Ellyn, West Chicago, and Villa Park, is the most reliable and trusted dealer in the region. We carry a wide selection of new Ford, Chevrolet, Buick, and GMC vehicles, as well as a huge inventory of certified, quality-condition used vehicles. Combine our selection with the best in quality service and repair, and Haggerty Auto Group is your one-stop shop for all your automotive needs. If you want a used car which is reliable, high in quality, and affordable, start your search at the Used Cars section on our website. Here at Haggerty Auto Group, we offer a diverse and top-notch collection of certified vehicles, including late model certified Ford, Chevy, Buick, and GMC vehicles. Your relationship with Haggerty Auto Group doesn’t end with the purchase of one of our new or used vehicles. We offer reliable service and repair to the many makes and models we sell and more. Our service centers are equipped with the latest tools and technology in the automotive industry to diagnose a wide variety of engine issues, including those hard-to-find issues that plague other service centers. Our service teams are experienced, industry-trained, and certified in their various areas. And for any accident your vehicle may be involved in, our Collision Center is well-prepared to handle both minor and significant damage to your car or truck. Our dedicated team of industry-trained and experienced personnel not only knows how to restore your vehicle to its prime condition, they’re determined to do so. Here at Haggerty Auto Group, we understand what your vehicle means to you, and we know the importance of getting the repairs done right. Bring your vehicle in for your next service appointment and you won’t be disappointed. Customer service is our top priority here at Haggerty Auto Group. 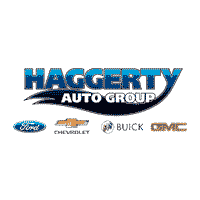 Regardless of whether you plan to buy a new or used Ford, Chevrolet, Buick, or GMC, or bring your vehicle in for repair or service, you will always find the best prices and outstanding customer service at all Haggerty Auto Group locations. No other group dealership in Illinois sells more new & used vehicles of our brands or has more satisfied customers than Haggerty Auto Group.